June 25th is National Log Cabin Day. What better place to observe it than in the Smoky Mountains? None, we say. Our neck of the woods boasts thousands of rental cabins – you can virtually write your own ticket, cabin-experience-wise. Come see! The history of the log cabin is as interesting as today’s diversity of design in these structures. The Swedish are thought to have brought the design to what is now the United States of America. It was a style of housing popular in their country, as the houses were especially warm and provided excellent shelter from the extremely harsh winters. Early settlers quickly realized the log cabin could physically stand the test of time and the heartwarming design continues to do so. 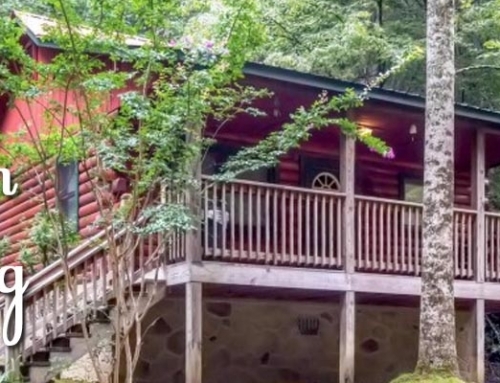 Cabins have stood the test of time when it comes to a mountain vacation too. While your lodging choices are plentiful in our area, there are many reasons for choosing a cabin rental over hotel accommodations and the upcoming National Log Cabin Day is a perfect opportunity to tell you why! First, you will enjoy far more privacy. If the kids get a little loud during their ping pong game, no worries! Second, you will save tons of money eating in. Most cabins have fully-equipped kitchens. Rare is the hotel that will allow for grilling out on the balcony, but virtually all cabins offer an outdoor grill. Thirdly, you’ll feel at home. After all, you’ll be staying in a very cozy, lovely home! Perhaps the most important reason of all to rent a cabin versus a hotel room is that you can make memories with your family without even leaving. You won’t have to spend a dime (other than the makings for s’mores). Play board games, sip coffee on the porch, or jump into the hot tub. It’s the only place where the accommodations themselves are a fun venue. A cabin also affords each member of the family the opportunity to get away to a quiet spot either inside the home or on the porch for a little “me” time. We all need some privacy, even when on vacation! It goes without saying that nowhere does it feel more appropriate to enjoy a stay in a log cabin than in the mountains. Ours is a dreamy place, rooted in traditional southern values and hugged by beautiful mountains that recall a simpler time. The perfect little (or quite large) cabin nestled here will be just what the doctor ordered for complete stress relief. All across the nation this Log Cabin Day, people who love these homes will come together to participate in restoration projects for historic cabin structures in their communities and for education about them and celebration of their worth. You might not be able to do that, but you can certainly do your part to celebrate by enjoying a cabin in the Smokies!